#1 CLUB - Pre-cut Fusible APPLIQUES + SEWING PATTERN: Approx $30 each and includes pre-cut fusible appliques plus sewing pattern. #2 CLUB - Emb Compatible Pre-cut Fusible APPLIQUES + MACHINE EMBROIDERY CD: Approx $55 each and includes embroidery compatible pre-cut fusible appliques plus a machine embroidery CD each month and pattern is included on CD. 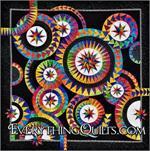 #3 CLUB - Pre-cut Fusible APPLIQUES ONLY - MACHINE EMB VERSION: Approx $20 each and includes pre-cut fusible appliques only - CD or pattern are not included. 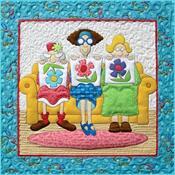 #4 CLUB - Pre-cut Fusible APPLIQUES ONLY - SEWING VERSION: Approx $20 each and includes appliques only - pattern not included. OPTIONAL ADD-ON *FABRIC PACK*: Can be added to any of our clubs listed above. YES, please include the extra *Fabric Pack* if available (not available for all kits). 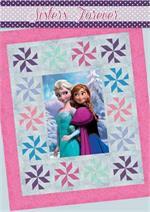 Approx $29 each and include applicable fabric for background, pieced blocks, borders, backing, binding. 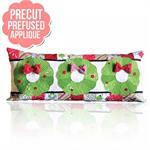 Pre-cut & Pre-fused Appliqué Kits! 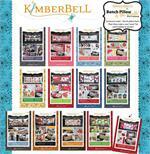 Celebrate each month of the year plus holidays with our new Kimberbell Bench Pillow Series! This monthly series is so welcoming and inviting - in fact, you are going to love how this pillow series will look on a bench, sofa or even your bed! 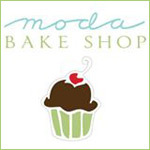 Great for gift giving too! This series is so fun and easy - you will love how quickly these whip up and require little storage space as you re-use the interior pillow form each month. 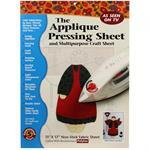 Machine or hand piecing. Finished bench pillows measure approximately 16" x 38". This initial order includes your Registration into the club of your choice PLUS fabric and pattern for the re-usable pillow form cover. 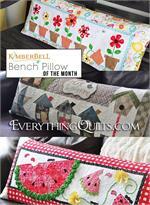 Each month thereafter you will automatically be billed/shipped a themed monthly bench pillow cover kit based on the club series you have selected plus regular shipping. Please note that club kits may vary up or down during membership based on fabric appliques included and/or increased costs. 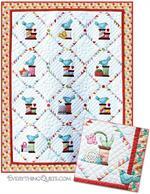 Your 2nd or 3rd kit will also include an Embellishment Rick Rack Embellishment Set for the calendar month kits. 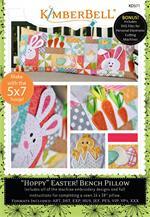 We currently have 15 bench pillow covers with this series (January thru December, Happy Birthday, Easter, and Game On). We will continue to add new kits as they become available so you do not miss out. If you have one already, or do not prefer a certain holiday, just let us know by adding a note in the comments section of this order. We automatically bill & ship your club order each month. Regular shipping rates apply. Kits may ship out of calendar order, but you will not miss any of the kits. You may also request to be billed/shipped remaining kits in your membership all at once, or any frequency over 2 per month during your program. You may change or cancel your club membership within this series with one current month club billing plus one additional month club billing as we do prepare ahead. If you have any pending payment orders those would need to be paid as well. 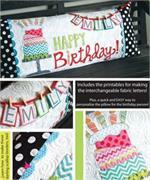 Fabrics are representational and may vary from image shown based on availability.